Kapil Bhalla (National Director) and Bivujit Mukhoty (Programme Manager) along with filmmaker Kartikeya visited the Gender Diversity Empowerment Project in Singur, Hoogly, West Bengal, on 21st and 22nd of September, 2015. The team visited Sri Sarada Math Rasik Bhita on the 21st and met with 76 Awardees at different Award levels. Reviewing the progress of the project, the team interacted with and interviewed the Award Leaders and Gold Awardees. The Awardees who received their Gold Award in 2015 and those who had received it the previous year, came and shared their experiences and challenges while doing the Award. The team also interacted with Adrija Chatterjee (Award Leader and in-charge of the Gender Diversity Women Empowerment project) who shared her experiences of the last 10 years with the Award. The interaction with the Leaders and Participants were on the different aspects of the Project. Later the team met with 11 Gold Award holders (received their Award from Randhir Singh on July 16 at the Gold award Ceremony in New Delhi) from All Bengal Women Union. Gold Award holder Pallavi Mondal shared her happiness that involvement with the Award and her achievements was a big positive in getting admission to the NDA for her Air Force course. I became a part of the IAYP programme four years ago, and the Gold Award Ceremony held on the 16th of July took me down memory lane, to the past four years of my journey of getting the Bronze, Silver and Gold Awards. I remember the 14 year old girl, who had just entered into high school and was excited about the adventure camps that she would get to be a part of and enrolled for the Award. Little did I know that this would become such an important part of who I am today. I was in the 9th grade when I received my Bronze Award. I took up dancing as a Physical Recreation, where I learnt dance forms like jazz and freestyle. For the Skills section, I took up baking, another passion of mine. However, undoubtedly, the most interesting and fun sections were the Service and the Adventurous Journey sections. I got involved with Shiksha Kendra, an initiative to teach the underprivileged children of our society subjects like English, maths and the social sciences. For the Adventurous Journey, I went to Mori, Uttarakhand, where I took part in white water river rafting, rappelling, trekking and cliff diving. Getting the Bronze Award after months of involvement in various activities, the exhilaration, and the ability to learn, filled me with a newfound thirst to learn more and become more, and I knew one thing for sure, there was no going back! For the Silver and Gold award, I pursued dancing and swimming under Skills and Physical Recreation respectively, with the same vigour and zest and learnt new things under the guidance of my proficient instructors. I also got a tremendous opportunity to work with Teach India -- an initiative by the Times of India and the British Council, which aimed at spreading awareness about the importance of the English language and facilitated its learning for people, in order to improve their quality of life by providing better employment opportunities. I was actively involved with this endeavour by Times of India, and got an award for Excellent Contribution and Best Volunteer. The Duke of Edinburgh's International Award Programme made me recognize the significance of giving back to society. This inspired me to also volunteer for an organisation which dealt with children fighting with cancer and I collected funds at carnivals and also conducted bake sales. Finally, the Residential Project under the Gold Award, gave me an insight into the life of the villagers. I went to the village Ghamroj, near Sohna Road, Gurgaon, Haryana, where we saw factories where bricks were made, went to a cowshed and organic farms and also met the village head, who enlightened us about the improvement of education and sanitation facilities in the village. The Award gave me an opportunity to engage and acquire a new set of skills. I got the liberty to design my own programme and set my own goals by challenging my boundaries. Thank you IAYP! Trupti Panigrahi, Gold Award Holder from the Open Award Centre shares here life changing experience during her Award Journey. Being honoured with the Gold Award by the IAYP (International Award for Young People), worldwide known as the Duke of Edinburgh's International Award, was a dream that came true for me. I started my journey five years ago with the aim of serving society and working towards self-growth. This journey has given me much more than what I could ever imagine. It has instilled in me the thirst to learn more, explore more about life and evolve as a good human being. It has taught me to never give up and never look back. It was through this journey I realized that in spite of being a small creation of the Almighty, I can bring about a remarkable difference in his world. It has made me realize my self-worth and importance. It has made me understand my responsibilities towards my own self and towards society at large. This Award has given me an opportunity to challenge my own beliefs and come out of my self-created boundaries. I am extremely thankful to the Award India for providing such a platform where young people get engaged in developmental work. This not only benefits them but also the people surrounding them and creates a brand value for their respective countries. I am sure I will see more and more people joining this endeavour and having such amazing experiences. As the last leg of my Gold Award (International Award for Young People), I went to an adventurous journey in a place called Great Glen in the Scottish highlands. The Great Glen is one of the most spectacular geographical features of the British Isles. The ten-day trekking trip started on February 2nd 2015, the day I boarded a train from London King's Cross to Edinburgh in Scotland. After this six-hour journey, I boarded another train to Glasgow, and finally from Glasgow Queen Street it took another four hours to reach Fort William, where I met other colleagues, guides and settled down in the chalets there. Fort William acted as the nodal point of the trip from where we would trek radially to different places the following days. Scotland, like the entire United Kingdom, is known for unpredictable weather and being a person from India, the extreme cold is something I always dread. Anyway, we were lucky with the weather. The first three days were very gloomy, but the rest of the trip was good sunshine and blue skies. The main highlight of this entire trip was not just adventures but also getting an insight into the ice advance in the region, considering this part of Scotland has witnessed serious climatic changes in the recent past. The first day involved an expedition to Ballachulish and Corran. We all found it challenging as it was raining a lot and that added to the bone-chilling weather. Well, that made the entire group ready for the following days as it was just the start! For me, the sky-lift to the highest peak of Scotland was the attraction of the day. To my surprise, the sky lift was open (with very little safety provided!). For an acrophobic person like me, it was a really tough experience, however the stunning scenic beauty at the top made up for it. The next two days, we travelled to Arisaig and Achnacree respectively, where we scaled several hillocks and did coring at several sites. Coring is actually a tiring job, especially when the weather is not supportive and the land is all marshy, nevertheless, it's very important to understand the soil beneath and inferr other information from it. The fourth day, the sun was kind and we trekked to Loch Lomond, the largest lake in Great Britain. It is also a very popular boating site and we all did various water sports. I myself went canoeing and really enjoyed it. The following day we went to a national park on the other side of Loch Lomond, a site considered very sensitive to environment changes and home to various indigenous flora and fauna. I was lucky enough to spot a golden eagle and a herd of red deer. The park is so big and dense that we really had to walk a lot to get a glimpse of a few animals. The sixth day we went to see the great "parallel roads" of Scotland which are actually shorelines of a past ice-dammed lake, which are at considerable heights. The "roads", slashing through the hills have left scientists baffled for really long. Below these "roads", we saw the River Roy which splashes down its rocky course, surrounded by a narrow strip of woodland. The seventh day marked our journey to Drumlochter which bears the marks of massive glaciation with its legacy of moraines, eskers, raised beaches and ice dammed lakes. This place has some really rugged terrain which makes it a paradise for people looking for 'adventurous treks'. We did, however, scale much height owing to security concerns but it indeed looked stunningly tempting. The eighth day was the relaxing day for us and most of us chose to stay in our chalets and enjoy local Scottish cuisine. The ninth day saw us again exploring a new lake, this time Loch Etteridge. It's a relatively longer lake than Loch Lomond and we were to boat till its centre and collect some cores from the surface underneath. Boating all by yourself in a big loch was a certainly memorable experience. The local birds and bright Sun added to the memories and the coring, generally a tough task, finished in no time. Rupanjan Goswami, Award Leader, Ramakrishna Mission Blind Boy's Academy, Narendrapur, Kolkata reports on the Award Programme at the Academy. Ramakrishna Mission Blind Boys' Academy, Narendrapur, Kolkata -- a pioneer institution for visually differently-abled boys in India -- has been participating in the International Award for Young People (IAYP-INDIA) since 2002. This institute provides various forms of support to the boys to assist in mainstreaming them into society. The R.K.M.B.B.A offers multifarious activities inside one campus, such as a residential setting, vocational training centre, braille press, agricultural training centre, talking book production centre etc. The ambience and infrastructure of the academy gives enormous support to the students for their all-round development, so that they become contributing members in our society. We aim to nurture them as leaders in our society and don't regard them as differently-abled; we encourage our boys to tap their potential. With the introduction of the Award Programme, these participants proved that they do not need to be treated as differently-abled. The National Award Authority is treating our participants at par with other participants and this has boosted their morale and self-esteem. Our boys follow the same programme and perform the same tasks allotted to other students, successfully scaling all the parameters required by the Award. We all know that the Award is challenging and not easily attained, but our participants accepted the challenge bravely, completing all the sections within the time frame. Here is an account of the different activities in which the participants are involved. The participants undertake Service to develop a lifelong commitment to society as civic or social volunteers. They take up different subjects as part of their Service Section such as Environmental Management, Cleaning drive, Braille teaching, Food Serving etc. in the school's hostels. All their activities are strictly monitored by the Award Leaders. We have noticed the benefits of Service among the participants. The Service section of the Award enhances their patience, tolerance and feelings of fellowship. It helps them deal with fear, ignorance and apathy, which are the main barriers to achieve a sense of responsibility towards the society. We have also noticed an improvement in their communication skills and sense of responsibility. The Award has helped them break the barriers and fears that inhibited them from being involved in social duties and responsibilities. For their Skills section our participants choose one of these subjects: Chess, Clay Modelling, Classic Indian Music (Vocal & Instrumental), Computer (Jaws supported), and Hand encrypted Braille magazine production. Under the supervision of concerned teachers and instructors the participants successfully complete this Skills section. We have noticed their amazing transformation and the development of their talents. Their self-confidence has been boosted as they become aware of their potentials. After successful completion of the Award many participants have successfully established themselves as professional entertainers and performing artists. Skills section opens their scope to choose their livelihood too. Our Award participants take one of these: Yoga, Swimming, Cricket, Football, Athletics (Track & Field) etc. as their Physical Recreation. Our Academy has a standard swimming pool and well maintained playgrounds. Under strict guidance of qualified swimming instructors and physical instructors and coaches our participants develop their physical ability and fitness and adopt a healthy lifestyle and habits. Their sense of achievement emerges and they learn how to work as a team when they approach team sports like cricket and football. We are proud to inform that some of our Award participants among the best swimmers in our country. These participants lift more or less all the medals and trophies in the State and National level swimming competitions for the visually challenged youth. Not only that our participants lift most of the prizes in the Pare-Olympic games, where they take part regularly. One of our participants took part in the International Para-Olympics in Germany. In cricket our Award participants also lift trophies in National and State level tournaments consistently. We believe everything is going in the right direction due to the structured approach of the Award programme. This is the most awaited section for our participants. They regularly take part in Adventurous Journeys to different, challenging, unfamiliar locations. Sometimes it is altitude trekking in the great Himalayas, sometimes it's Coastal Trekking along the seashore of the Bay of Bengal and sometimes it is in the invincible mangrove forests of the Sundarbana. At other times they attend nature camps and rock climbing courses along with training on survival in different critical and hostile climatic conditions. Since 2002, Adventurous Journey are being organised and evaluated by the the Institute of Climbers and Nature Lovers (ICNL). Qualified, experienced and die-hard ICNL instructors supervise the Adventurous Journey segment strictly. There are no modifications or adaptations to make the Adventurous Journey of our participants smooth or easy. These visually challenged participants face the same challenges, same conditions and same tasks given to their sighted counterparts. The participants enjoy the practical phase of strenuous rock climbing and survival courses. To enhance experiences through involvement with others in an unfamiliar residential setting, our Gold Level participants take up different subjects for their Residential Project. Some participants choose activity based projects like outdoor sports, skills development by joining cricket and football coaching camps, some of them select environment and conservation projects in unfamiliar locations and work in restoration program of rural religious temples and mosques, village roads and dikes. Some participants take personal training course like Spoken English course, Computer course, etc. Our participants take all these challenges wholeheartedly and complete their Residential Project as perfectly as they can. We get remarkable response from the society, Village people who tell us that they are being inspired when they watch our participants help and solve the village's problems with their own hands and can't resist joining in with our participants. We feel great when we see our participants successfully strike on the apathy of the village people for their own problem. This is what we can call leadership. We also notice that our participants are getting accustomed to unfamiliar places and unknown people with enriched sense of responsibility and communication skills. They are able to build new relationship with different people regardless of their age, race and religion. We believe this segment broadens our participants' outlook and horizons, which is the sparkling philosophy of the Award. I was introduced to the Award programme during my visit to Sri Lanka to cover the Commonwealth Heads of Government Meeting. I applied as Open Award Participants for Gold Level and set my goals, which I have completed now. Photography was my goal for the Skill section. I was interested in photography because of my artist friends, who helped me develop a sense of colour balancing and framing. Previously, I was able to take average frames from a point-and-shoot camera but DSLR camera opened more opportunities with 'Manual' mode. When I first started photography, I was very puzzled about aperture (A), shutter speed (S) and ISO. I call this the "Illuminati triangle of confusion" because they're all linked to each other and I couldn't differentiate the effects between them by reading. But one thing made it easy for me. Eyes! Our eyes pretty much work the same way as a camera. The light passes through our pupil, via the hole of the iris, and focuses it on the retina. The pupillary light reflex is the reflex that controls the diameter of the pupil, in response to the intensity of light that falls on the retina of the eye. In other words, when you stare at something bright, our iris shrinks and the pupil becomes smaller, so less light penetrates through. "So shutter speed is the time for which you want to keep your stutter open to allow the light to pass through to the camera sensor." The higher the shutter speed, the more light is allowed through. When you are taking a picture in a place that's terribly bright (like directly under the Sun), then your picture would be overexposed (way too bright). So don't forget to reduce your shutter speed. Stare at the room around you for a while. Slowly focus on an object in front of you. Keep doing it. Now, do you realize how everything around the object is blurred (the object becomes more prominent). But when you want to see a group/crowd/landscape, the same eye allows you to see everything clearly. That's exactly how aperture works. Basically, aperture controls the depth of field in focus. When the aperture is greater, the depth of field of an image is shorter. In other words, the object in front of you is clear and the background is blurred out. Aperture also controls the amount of light that reaches the image plane because aperture acts as the entrance of our eyes. Like our eyes, the pupil is the hole that allows light through in our eyes. "So aperture is the shutter size which you want to keep open for a particular time (shutter speed)." Aperture is calculated in stops (the size of the hole that allows light in). Same as the pupil of our eyes, the bigger the hole, greater the aperture, and more the light that passes. But here's the confusing part: aperture is measured with f/numbers on the camera. The smaller the f/number on your camera, greater the aperture: the more light that reaches the image plane, making the image brighter and more blurred background (less depth of field). It is the measure of how sensitive your camera is to light. Basically, the image sensor, the one that controls the ISO, is the component that changes the camera's sensitivity and transforms the light into an image. The higher the ISO, the more sensitive it is to light. Therefore, the camera sensor can capture images in a low-light surrounding without a flash when using a higher ISO number. But you need to give something if you want something. Higher sensitivity adds "noise" (grain) to your picture. The fine dots that make the picture look pretty bad. So, my advice is to always stick to the lowest ISO number of your sensor. Basically, it produces an image with the highest quality and minimal noise! It also retains the most details of an image. Also there are a set of rules for composition like rule of third, golden triangles and spirals, leading lines and leaving space etc. But photography is also more than rules. So in a nutshell, shutter speed controls the amount of light; aperture controls the depth of field, and amount of light; ISO allows you to take pictures in dark areas without a flash, but it creates noise. Photography is all about balance of these three. Sanganabasava International Residential School and Kavalagi village Panchayat have decided to collaborate for the overall development of the village by initiating a number of focused projects. The programme was formally inaugurated on 23rd November 2014 at the Kavalagi school grounds, in the presence of all the Award participants and mentors. The school has planned to build two blocks of 40 toilets (20 for Kavalagi and 20 for Honnutagi) each at two locations of the village as part of the Swachh Bharat Programme. The ethical values that the school has nurtured in students was motivated by the "Clean India Programme" initiative of Prime Minister Narendra Modi. The Award participants in groups of four took an oath on 25th Sept 2014 to undertake the programme. The development programme is planned to be comprehensive. It includes a basic literacy programme, a health development programmme and maintaining a plastic-free zone in Honnutagi & Kavalagi. The people from the panchayat attended the inauguration. A powerful video programme was arranged to educate the people about the perils of alcoholism and smoking. Thanking the school authorities and students for the development initiative, the principal in her concluding message said, "A happy, prosperous and peaceful life for every Indian is a dream that we should cherish and realize". Award participants of Cambridge International School Phagwara, in their commitment to preserve and nurture nature, moved a step forward by adopting a local park in Phagwara city. 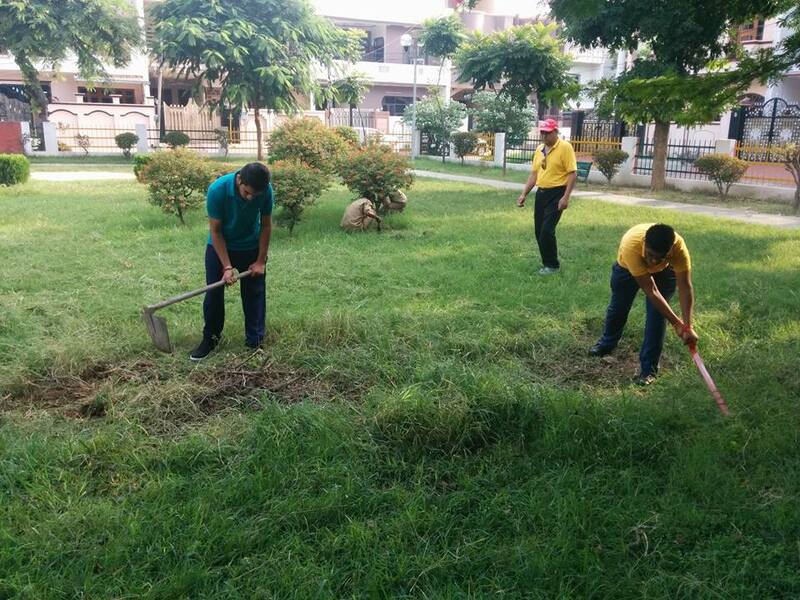 The school took this initiative in a collaborative effort with the residents of Urban Estate Phagwara to improve and maintain the park. Mr. Som Prakash, MLA Phagwara City, inaugurated the event. He motivated the participants to follow the Swachh Bharat Abhiyaan to keep the city, state and nation clean. This initiative was further supported by residents and community members who will volunteer their time to improve the chosen park. All the IAYP participants and members present there pledged to keep the park clean and work on a variety of projects including planting and maintaining flower beds; maintaining the trails and paths; painting and caring for park structures; cleaning up litter; planting, mulching, and watering trees; and ensuring the park is well maintained. The Award participants also pledged to visit the park every Sunday. An inspirational song "Zariya" sung by the students of Cambridge International School strengthened the spirit of the movement. Principal Jorawar Singh encouraged the students to preserve nature for our future generations. Pankaj Gautam, a leading businessman of the town and a great social activist also motivated the students to plant more trees. The event was initiated under the guidance of Anita Somprakash, Jaswinder Kaur (MC), K. S. Bains (Managing Director CIS), Jorawar Singh (Principal), Amarjeet Singh (Administrator), Pankaj Gautam, members of Urban Estate Phagwara, staff and students of Cambridge International School Phagwara.